After the success of CPSE – ETF, again Finance Minister Mr. Arun Jaitley has launched a new ETF. On Friday, 4th of August 2017, the FM has declared about the new Exchange Traded Fund namely Bharat 22. This will consist of 22 blue chip companies. According to the FM this will be another success story in the field of stock exchange where investors will be able to earn 15% more profit than others. 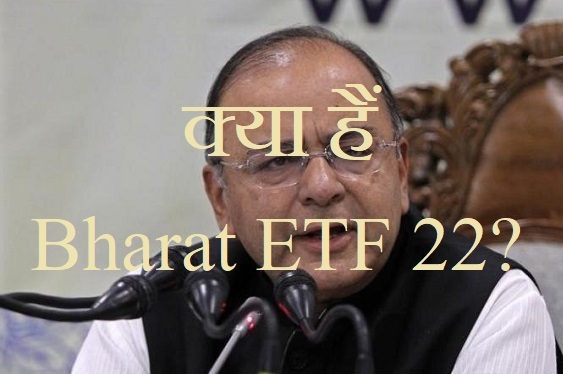 What is Bharat ETF 22? The government has launched the Bharat 22 ETF app that shall be monitoring market performance of around 22 stocks. The government wants to monitor the stocks for its reduced stake value. The new ETF is meant to maintain private sector banks and over 22 companies stocks. Apart from this it also holds stocks for government owned private sector companies. Bharat 22 is also second of its kind ETF apart from CPSE ETF that was launched initially in 2014. The ETF 22 shall be managed and regulated by ICICI Prudential. The same company also regulates Mutual funds. Asia Index company shall regulate and offer with Index stats. The rebalancing of index will be performed yearly by the company. This means that each investor in the market can gain better returns. This shall offer investors with long term benefits for reforms, disinvestment and governance. The government has not yet finalized the launch dates for Bharat 22 . We can expect that it shall be launched for traders soon. It shall also be launched in multiple trenches. It is also certain that the initial launch product will work similar to CPSE-ETF version. At the stock market traders and companies host various commodities, future, options, bonds and stocks. It certainly becomes very difficult task for tracking each movement and trend of the stock market. So under this circumstance a smaller version of the whole market is monitored. The smaller version is designed to provide traders and companies with complete working report of the stock market and its performance. You can collect more details regarding Index and Stocks in this article. When speaking of India, Sensex monitors the increase and decrease of stock market price for 30 distinct companies in BSE. Deepak Mohini coined the term Sensex from sensitive index. NSE offers with its counter part for Nifty for monitoring stocks of 50 companies. S and P BSE index monitors the performance of 100 companies (Large cap) to measure the performance at large scale. It monitors the performance on the basis of liquidity and size. The index is calculated in INR and is marked as BSE 100 ticker. Investor’s diversified portfolios are offered under Mutual fund pack. In general expert advisors manage mutual fund investments on account of other investors in exchange for nominal fee. It is done with an aim to offer benefit of the changing market trend for investors by providing right information to generate better profit margins. Index funds are designed to monitor the performance of marked index. Under Nifty and Sensex stocks of 50 and 30 index are monitored. The security offered is in the same proportion by Index fund as compared to the real index such that with the decrease in value of the fund shares the index also decreases. With the change in index it will perform the action of selling and buying index (By composition or weight). The ticker symbols are designed to trade for every change with the market trend. ETF (Exchange Traded funds) are equivalent to Mutual finds as they offer with similar investments opportunity and security level. Traders have the convenience of diversification of mutual fund and stocks as well. ETF’s are designed to track the movement of index funds for marked index. They are considered as passive funds. So it is certain that the status of assets always remain unchanged. So the same portfolio is maintained and offer with low trading ratio. ETFs are designed to perform trade just like stocks throughout the day time but Mutual funds may only trade during the day end depending on the asset value price (NAV). They offer with reduced trading expense as they monitor only particular index. The do not offer with sales load or investment minimums but mutual funds offer with both scales. In general indexed funds will not offer with sales load. Why has the government decided to launch Bharat 22? With the launch of Bharat 22 government shall target and implement disinvestment program for investors. A set budget of Rs 72,500 crore has also been announced by the government for 2017-18. Presently government has recognized disinvestment transaction of over Rs 9300 crore. The target will be met with the launch of Bharat 22. EYF offers traders with a smart trading mechanism such that government can use it for targeting disinvestment which is a factor that will help in regulating deficit. Initially at the time of disposing Big stakes the stocks would get beaten down invariably in he long term unsatisfying the employees. With the launch on ETF route it is certain that government can target smaller stackes from the big bundle by around 2 to 3 percent. This means that state’s are able to recover the money. At the same time employees and investors are also able to recover their money from PSU. The government has managed to collection around Rs 11,500 crore using CPSE ETF for three distinct trenches. In March 2014 the government has managed to collect over Rs 3000 crore the moment it had launched CPSE ETF. This had supported PSU trading funds for 10 companies. In the next trading it managed to collect over Rs 8500 crore in fiscal year 2017-18. Reliance mutual fund manages CPSE and it offered customers with opportunity to trade in Navratnas and Maharatnas at 5 percent discounted rate. It is also obvious that retail investors had good experience when using CPSE-ETF for trading in the market. At the time of economy crises in 2015 the rates had lowered to as much as 14 percent. In 2014-16 it is certain that the rates had increased to over 18 and 29 percent. This is much higher in value as compared to BSE rates that was equivalent to 23 percent and 1.9 percent. CPSE ETF in general traded in companies that were state government owned, Bharat 22 is designed to trade in private sector as well for selling short stake. It is also certain that Bharat 22 will maintain SUUTI holdings as well. Presently SUUTI is managing its stake holding in over 50 distinct companies including Axis bank, ITC and L&T. Initially SUUTI was regulated by UTI and presently Axis bank, ITC and L&T are offering high value at over Rs 50,000 crore. For monetary while index will be provided by Asia Index Pvt. Ltd. The company shall balance the index yearly. It shall offer with distinct portfolios for companies including 20 percent cap value and 6 sectors including each stock valued at 15 percent. Bharat 22 is ETF that maintains index for 22 companies along with FMCG, minerals, Utilities, Industrials and energy sectors. Is investment in Bharat 22 profitable or not? Initially government offered customers with bonus offers and discount rates to help retail investors boost their performance. Retail investors can expect getting over 5 percent discount rate using CPSE ETF. Presently government is aiming at disinvestment, governance and reforms so it is certain that with Bharat 22 government expects much higher returns. This will help improve the performance level for government over the years. It is also certain that PSU’s were involved with an aim to alter the working pattern of the government sector including its policies for monetary and fiscal performance. If the change gets unenthusiastic then it can also affect the current market trend. It is certain that the process of subscribing for Bharat 22 is very much similar as compared to ASBA and IPO. It is certain that the purchase can be made just like any other stock purchase. To make your investment you have to be listed wit KYC. You need to have a valid Demat account for Bharat 22. Tax calculation and ETF calculations are done in the similar manner for both funds and shares. 15 percent tax is calculated for STCG and at the same time LTCG is non taxable. Bharat ETF 22 is not performing. Central Government has been benefitted at the cost of Investors. Further it is observed that even name of stocks included herein have not been correctly spelled.